What makes a true hockey rivalry (not one manufactured for TV)? The more bitter the hockey rivalry, the better. There has to be bad blood; the kind that comes from blood spilled and championships lost. There has to be a deep-seated hate that makes losing hurt the most. The Pens and Isles have such a history. I went back as far as 1975 to look at this rivalry. The two teams faced each other in the Quarter Finals that year. The Pens took the first three games and it seemed as though they would sweep the series. The Islanders rallied and took the next three to send it to a nail biting Game 7. Ed Westfall scored the only goal of the game in the 3rd period. The Isles became the first team since the 1942 Maple Leafs to erase a 3-0 deficit to win a best-of-7 series. 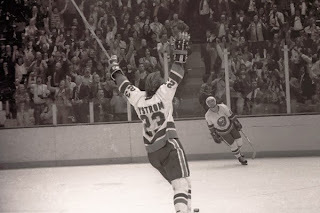 Flash ahead to the 1982 Patrick Division Semi-Finals when the Pens and Isles contested. The Islanders were heavy favorites as they were riding a 15 game winning streak into the match-up. They trampled the Penguins 8-1 and 7-2 in Games 1 and 2. That left the Isles so confident going into game three that they checked out of their Pittsburgh hotel rooms prior to the game. Whether that propelled the Pens or not, they defeated the Isles in overtime on the back of a Rick Kehoe goal. They also took the next game in the ‘Burgh, sending the series back to New York and into one of the great games in Coliseum history on April 10, 1982. The Islanders were trailing 3-1 late in the third period when they changed goalies. At the time, the rules allowed for the goalie to warm-up when there was a change. That night it also had the effect of allowing the Isles to rest. John Tonelli scored scored the OT winning goal and the Isles took it in Game 5. 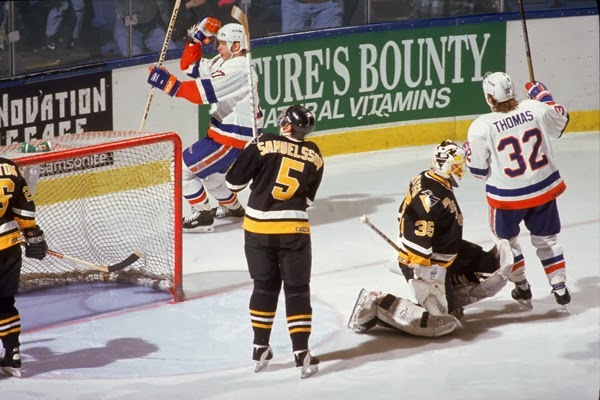 The Penguins went into the 1993 Patrick division with two Stanley cups on their backs, a 17 game regular season win streak, Mario Lemieux, Jaromir Jagr, and Ron Francis. The Isles took game one of the series and the Pens captured Games 2 and 3. Game 4 at the Colliseum was a 6-5 duel fueled by two Tom Fitzgerald shorthanded goals to tie the series. The Pens took the next but the Isles won Game 6 to take it to 7. That game was played May 7 in Pittsburgh. Despite being the underdogs, the Isles led 3-1 late in the third period. Glenn Healy was outstanding in net. The Pens did what the Pens did at that time; Ron Francis scored to cut the lead to 3-2. Then, with one minute left in the game, Rick Tocchet scored to force sudden death overtime. David Volek scored the winning goal in that overtime and the mighty Pens were dethroned. Newsday's front page the following day, over a picture of Healy, proclaimed in it’s headline, "It's a Miracle!" This remains, as of the 2013-2014 season, the last playoff series won by the Islanders in 20 years. 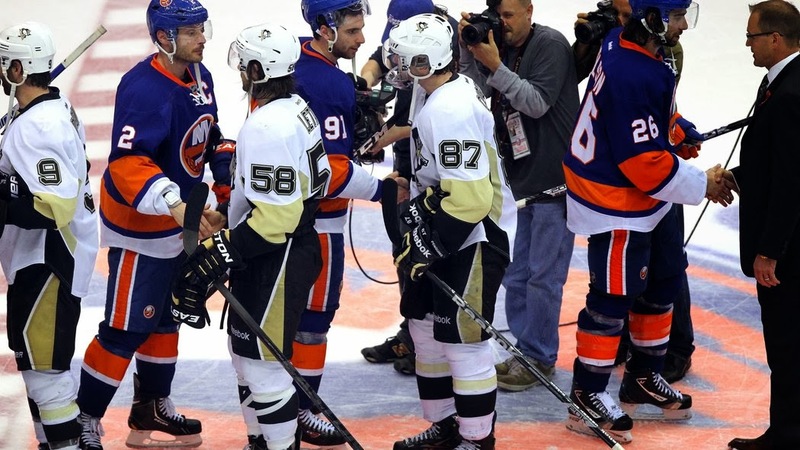 Through the years, the Pens and the Isles met many times with no love lost on the ice. Rivalries survive in an environment where something is at stake. Teams change over the years but the rivalry lives on when two teams battle in playoff games with more than just points are on the line. The Pens/Isles hate faded as both teams struggled to find success through the rest of the 90’s and into the 00’s. 2010-11 was an ugly season between the Penguins and Islanders. Early in February of 2011 things heated up between the two teams. In the first period of that match-up Penguins forward Maxime Talbot delivered a legal body check to the Islanders Blake Comeau. Talbot was not penalized and Comeau played for the remainder of the game but was diagnosed with a concussion two days later. Comeau missed four games. Another incident from that game is the now infamous goalie fight between Brent Johnson and Rick DePietro. With just 16.5 seconds left in regulation, Islanders goaltender Rick DiPietro shoved forward Matt Cooke as he skated through the crease. As Cooke fell to the ground a fight broke out, Penguin goaltender Brent Johnson skated the length of the ice and engaged DiPietro. Johnson, a right hander, threw a single left hook, knocking DiPietro to the ice. DiPietro was sidelined for six weeks following the fight due to facial fractures and knee swelling. The stage was set for February 11, 2011, Max Talbot’s birthday. Prior to the rematch, Isles tough guy Zenon Kenopka gave interviews hinting that the Isles had retaliation on their mind. That night, the Islanders took the ice in an aggressive manner. Michael Haley was assessed a roughing penalty at the 2:37 mark in the first and half way thru that period fought with Craig Adams. The Isles goon, Trevor Gilles squared off with Pens enforcer Eric Godard at around 18:00 min into the first period but by then the score was 4-0, all Isles, with Johnson again in net. All told, there were eight penalties in that period alone. The second period opened with the Isles scoring 2 goals within 30 seconds of each other. Johnson was pulled and was soundly booed as he went down the ramp to the locker room. Shortly after Johnson was pulled, the retaliation began when Matt Martin jumped Talbot from behind with a “suckerpunch”. This resulted in 3 separate fights breaking out on the ice. All six players were automatically ejected from the game after each received ten minute game misconduct penalties. Martin received an additional ten minute misconduct and a two minute minor for instigating the altercation. By the end of that period, 3 more minor penalties had been called but the Isles were leading 8-2. When the third period opened, Brent Johnson was back in net for the Penguins. At less than 5 min. into the period, Trevor Gilles threw an elbow to the head of Eric Tangradi. Young Tangradi fell to the ice but Gillies continued to throw punches. Gillies was given a five minute major for elbowing, a double minor for roughing, a ten minute misconduct, and a game misconduct. Despite being ejected from the game Gillies continued to taunt the injured Tangradi from the runway to the dressing rooms. Tangradi missed the rest of the season with a concussion. As that was clearing up, Haley fought Talbot but that was broken up. Haley left that scrum and looked down the ice. Johnson skated to the blue line and dropped his gloves. As Haley approached, Godard left the bench to join in the fight and protect Johnson. Godard was assessed a double minor for roughing and two game misconduct penalties, Haley received an instigator minor, two fighting majors, a ten minute misconduct, and a game misconduct, while Johnson was given a major for fighting. Haley was ejected from the game but the crowd triumphantly chanted his name. Both teams scored a goal during the third period, making the final a 9–3 Islanders win. 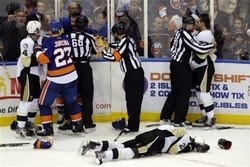 After all the ejections, at the end of the game the Penguins had seven eligible players, while the Islanders had nine. In all, 65 penalties were assessed, including 15 fighting major penalties and 21 game misconducts, for a total of 346 minutes. The penalty minute total set team records for both the Penguins and Islanders for combined penalty minutes. 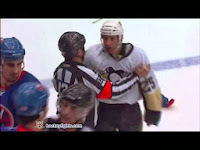 In the days following the “Brawl on the Isle” NHL handed out suspensions and fines for the incidents. New York's Gillies received a nine game suspension and Martin was given four games for their actions, which NHL Senior Executive Vice President of Hockey Operations Colin Campbell called "deliberate attempts to injure". The Islanders organization was also fined $100,000 for "failure to control their players". Pittsburgh's Godard was given an automatic 10 game suspension for violating league rules prohibiting players from leaving the bench to join a fight. The aftermath also had Mario Lemieux speaking his mind about how the league dropped the ball in not making a clear statement against such a melee. The broad response was that Lemieux employed Matt Cooke; therefore, he was a hypocrite. It remains a blemish for both teams. The Pens and Isles met several times in the next season but never again with such ferocity. Here’s what you need to know about the next time the two teams met in the 2012-13 playoffs: Brooks Orpik fired a slap shot from the left point that hit the back of the net 7:49 into overtime in Game 6 to give the Penguins a 4-3 victory over the New York Islanders that ended their first-round Eastern Conference quarterfinal. Orpik had never scored in 77 previous playoff games and didn't have one in the past 106 contests of any kind since his last goal, also against the Islanders, on Nov. 21, 2011. I don't think the Pens/Isles match-ups represent the fierce rivalry of the Pens/Flyers or Pens/Caps but there is a rivalry nonetheless. They have a history of titles won and dignity lost. Many of the players from the “Brawl on the Isle” in February 2011 have moved on but the scars of those games and the rivalry continue.